Is Lopez Obrador, Mexico’s Brash Populist, Still the Presidential Favorite in 2018? Mexican presidential hopeful Andres Manuel Lopez Obrador gives a press conference in Mexico City, June 6, 2017 (AP photo by Marco Ugarte). 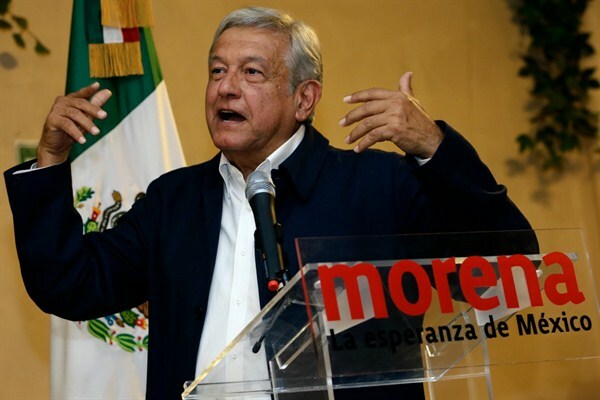 Gubernatorial elections in three Mexican states last Sunday were supposed to show Andres Manuel Lopez Obrador’s viability as a candidate in next year’s presidential race. Instead they checked the ambitions of the brash left-leaning populist aiming to succeed outgoing President Enrique Pena Nieto in 2018. Lopez Obrador’s party, the National Regeneration Movement, known as MORENA, lost in all three states.